1. Pre-heat the oven at 350 FH . 2. Cream Butter and sugar until light and fluffy . This is the very important part . The more lighter is this mixture, the softer is your cake . Now add in eggs one at a time . Blend them nice. 3. Sift flour, cocoa powder , baking powder, baking soda and milk powder. Fold them gently into the cake batter. Add the milk . The Batter should be medium thick, not too runny nor too thick. If you find it bit thicker then adjust adding little liquid milk .Add vanilla essence. 4. Add the dry fruits of your choice .Don’t add too much , especially the raisins. 5. Pour the batter into a greased bundt cake pan . Don’t forget to grease every inch of the pan . The batter should not cover more than 1/3rd of the pan , because the cake will rise upto the top and if it does not find enough space to rise up , the cake will fall apart in the pan. 6. Bake the cake for about 35 minutes or it is done . The time may vary oven to oven . Insert a knife into the cake , if it comes out clean , your cake is done. 7. Cool the cake and then run the knife around all of the edges to loosen the cake.Turn a plate upside down and place it on top of the cake pan. Then flip both of them at the same time so that the cake can land on the plate. At this point, if you’re not sure the cake is coming out, just tap on the pan for few times . Your Bundt Pan Chocolate fruits cake is ready . 1. Don’t let your cake sit for long after the preparation before baking. Always bake it immediately after you put them into the mould. So preheat the oven the time you started making the cake . So by the time the oven is preheated , your cake is ready to bake. 2. For a better cake , try every ingredients to be of room temperature . 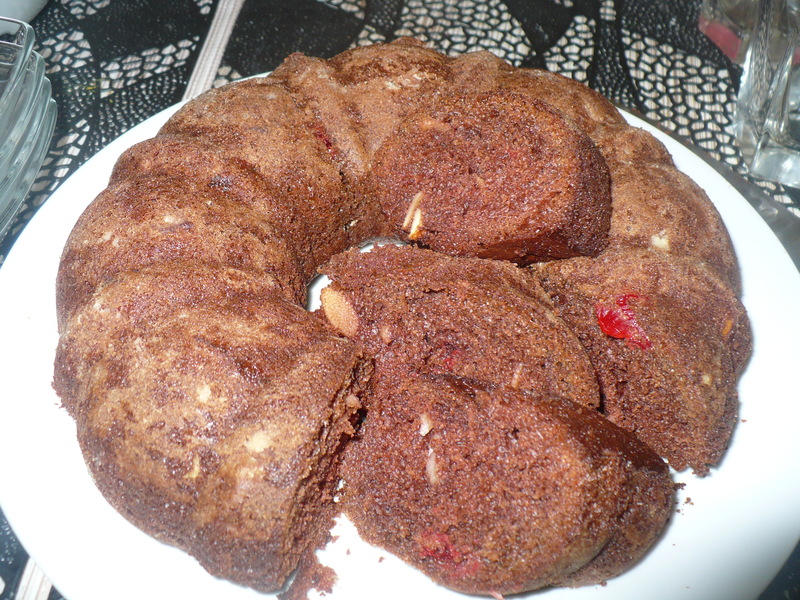 This entry was posted in Desserts, Glossary / Notes and tagged Bundt Pan Cake recipe, Bundt pan chocolate fruits cake recipe, cake recipe, Chocolate bundt pan Cake, Chocolate cake, Chocolate fruits cake. Bookmark the permalink.